Bengaluru has over 1,000 temples both old and new. In the heart of this modern IT city are temples that date back as early as the 10th century. 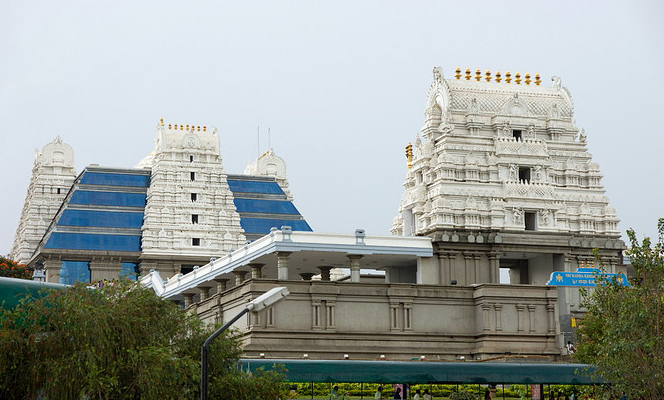 Here is a look at 10 of the most famous temples in Bangalore. Nestled in a place called Domlur near the Airport is Benagluru’s oldest temple. This temple was built in the 10th century by the Cholas and the presiding deity is Lord Vishnu. The temple which was once in shambles was renovated 20 years ago. On the pillars of this temple we see Lord Vishnu’s Dashavathars. Another interesting feature is the pranic energy felt in the temple. This temple is situated in South Bangalore’s NR Colony. The temple was built in the year 1537 by the local ruler of the erstwhile Vijayanagara Empire. The granite structure of the statue of Nandi the Hindu demi-god shaped as a bull is said to be cut out of a single piece of rock. This is supposed to be the biggest temple of Nandi in the world measuring 15ft in in height and 20 feet in length. The actual temple is small consisting only of the shrine. There is also an idol of Lord Ganesha, nearby. Every year on the last Monday and Tuesday of the Hindu month of Karthika a groundnut fair is held in the temple premises and the nut is offered to the deity. This fair is known as Kadalekkayi Parishe. This monolithic Ganesha is in the same temple complex as the Nandi statue. It stands about 18 ft. in height and 16 ft. in width. This Ganapati is popularly known as Shakthi Ganapati or Satya Ganapati. The idol is adorned with different decorations each day of the week. On one of the days this huge idol is covered in butter weighing over 100 kg’s. People from different walks of life come here to seek blessings of Lord Ganesha. This Cave Temple is an example of Indian rock-cut architecture. This 9th century temple is said to have been cut out of a single rock and is also famous for its stone discs in the forecourt. It is one amongst the few temples in Bangalore dedicated to Lord Shiva, the main idol being a Shivalinga. The front of the temple is adorned by a sculptor of Nandi. The temple also has a rare sculpture of the fire god Agni, with his two heads, seven hands and three legs. This temple see’s the largest crowd on the festival of Shivaratri. Devotees gather here on Makara Sankaranti day when it is believed that at a particular moment in the evening the sun’s rays fall directly on the Shivalinga inside the cave. Temple timings: 7.30 AM to 12.00 pm and again from 5 PM to 8.30 PM. Sri Radha Krishna Chandra Temple- This temple is situated at Hare Krishna Hill at West Chord road. This Neo-Classical temple is attached to a cultural complex occupying a seven acre hillock. It was built to commemorate the birth centennial of Sri Prabhupada the founder of ISKON. With its ornate temple arches, fountains and elaborated Rajagopuram this temple is a feast for the eyes. The four temple Gopurams are attached by a glass canopy. The deities worshiped are Sri Sri Radha Krishnachandra, Sri Sri Krishna Balarama, Sri Sri Nitai Gauranga, Sri Srinivasa Govinda and Sri Prahlada Narasimha. There is also a Vedic Museum, an exhibition area, and a lecture hall. The ISKON Vedic Theatre where multimedia Vedic films are shown. The Temple also has lodging facilities for devotees. Temple timings: 4:15 AM to 5:00 AM; 7:15 AM to 1:00 PM; 4:00 PM to 8:20 PM. It is impossible to miss the 65 foot high Statute of Lord Shiva seated in Lotus position, on Airport Road. Built in the year 1995 this architectural wonder is a must visit place for all tourists. It has a grand look and a towering presence. Over 400,000 devotees visit this statue on the day of festivals. It has the backdrop of Mount Kailash the Lord’s heavenly abode and the river Ganga flowing from his matted locks as depicted in mythology. Temple timings: 6:00 AM to 8:00 PM. Situated in the busy Kanakapura Road is the famous temple of Banashankari Amma .This temple was built in the year 1915 and the deity Banashankari Amma too was positioned there the same year. The Goddess Banashankari Amma is worshiped by many during the Rahukala to remove all obstacles and hardships. Though the temple is open on all days of the week, devotees throng the temple from dawn to dusk on Tuesdays, Fridays and Sundays to offer special pujas to the goddess. The main festivals celebrated are the Birthday of the deity on the 13th of September the, Dashera festival in October and the temple anniversary during Pushya Maasa which falls between the December and January. This temple is situated at Visvesvarapuram at Basavanagudi. This temple was built over 300 years ago and is home to some very interesting and intricate carvings. Though it is a relatively small temple the lion brackets and carvings of human and animal figures make it a unique example of Dravidian civilization. The figures of the Gods Brahma, Vishnu and Shiva adorn the walls. The idol in the sanctum sanitarium, is Lord Venkatarama. The people not only come to this temple to pray but also to marvel at the architecture. This temple Located in the Balepet area houses idols of Sugreeva and Venkateshwara. In the sanctum sanatorium placed on a pedestal is the temple i of Lord Venkateshwara. The Sugreeva idol, standing six feet in high may be mistaken for Lord Hanuman. The long teeth on either side of the mouth are the only thing which helps one understands the difference. This temple is situated in in Kumara Park. The Goddess Kanyakaparameshwari is the main deity in this temple. The temple is also unique because of its Marble work as well as the Murals done on its walls. The murals depict the scenes from the Bhagavad Gita and Vasavi history. Murals of holy places as well as of ancient Rishi’s can also be seen. The Darpana Mandira meaning mirror temple is also a main feature of this temple.